If you want to do something that very few tourists in Bangkok do, then go to the theatre. Between October 28 – November 26 you will repeatedly have the chance (for exact dates see end of this post) to enjoy a new play by Maurizio Mistretta. After the success of the first study of Pinocchio, the terrible Emperor Caligula is coming back for a new play written, directed and interpreted by Maurizio Mistretta. Ba Pai Laew / The last hour of Caligula is the title of the final study of the trilogy that ALL SOUL Production has devoted to Caligula of Camus. The event is an animate reconstruction of the last hour of the life of the famous Roman emperor Caligula before being killed in a palace revolution. Historically we don’t really know much about Caligula. Several and controversial research papers pop up repeatedly, but unluckily the only real source from that time, Svetonio, the Roman historian, is not very reliable. Nevertheless only a few facts are sure: Caligula was a very controversial emperor, he was very beloved by the common people and hated by the powerful Roman families and he was killed in a conspiracy after only three years of his reign. 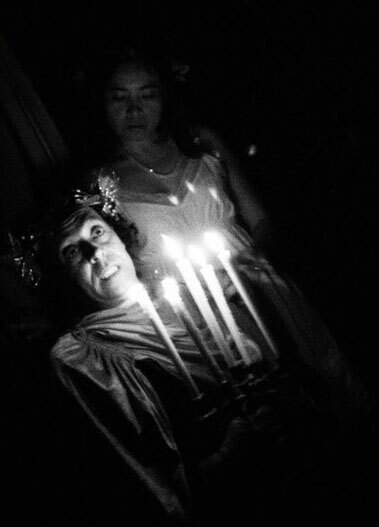 Ba Pai Laew is a classical solo performance of Mistretta, a challenged actor test bed. In an hour of solo Caligula will express his poetic view of the blood bringing event in a context of visions, symbolisms and violence: the origin of the knowledge and of the poetry. During our preceding episodes (Khamoey! and Som Nam Na) the stage action was filtered by other characters, some time according to the Camus’s script, some time by contemporary characters able to insert the piece in a context of a “modern social experiment”. The third episode has no middle-character, but it is the direct relationship between the actor on stage (Caligula was also an actor) and a narrow audience to a maximum of 10 elements. But who will represent the audience in this episode? They will be as usual the Patricians of Rome representing the rich families who are irritated by the extravagance of Caligula or those conspirators strongly intent to kill him? Perhaps they will be the one, perhaps the other, perhaps both. In this game of mirrors Caligula has an hour time to change and rewrite history and to postpone the time of his death to the following event. Caligula will be at ALL SOUL Chamber Theatre on 28-29 October and on 3-4-5-10-11-12-17-18-19-24-25-26 November at 9.00 pm. The ticket cost is of 500 baht (250 student and members), for a maximum of 10 spectators per night.